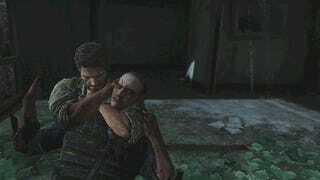 ​Should You Get The Last of Us Again On PS4? The Last of Us came out on the PlayStation 3 last year. It was very, very good. This week, a new and improved version of the game will come out for the PlayStation 4. But can a game that was already so good really be "improved" all that much? Tomorrow, The Last of Us: Remastered comes out for PS4. It's a redone version of last year's tremendous PS3 game, now boasting a higher 1080p resolution (compared with the PS3's 720p) and a higher, smoother frame-rate that "targets" 60fps (the PS3 stayed around 30, though it occasionally dipped below that). It includes the excellent Left Behind DLC episode, as well as all of the maps and modes released thus far for the game's surprisingly great competitive multiplayer. Over the past week I've spent a chunk of hours with a couple of versions of TLOU: Remastered. I played about six hours of a debug version Sony sent over, and another five or so on a retail version of the game, enough to get most of the way through Pittsburgh on hard difficulty. If you're just wondering if it's good: Yeah, it's good. It's great! It's The Last of Us. It's a really good game. They didn't replace the clickers with unicorns or dub Joel's voice over with Gilbert Gottfried or anything. If you already played the game on PS3 and are wondering whether you should pick it up again—for $50—on the PS4, well, that's a trickier question. It is, however, a question I have a feeling a lot of people are going to be asking. So, let's go into a bit more detail. It looks, and plays, much better on PS4. 60fps is no joke. The game doesn't run at a locked 60fps, and there were times when I noticed the frame-rate dipping a bit. But for the most part, TLOU: Remastered feels remarkably smooth, much more so than its PS3 predecessor. It looks much sharper in 1080p as well, particularly the character models, which when viewed up close now look almost as good in the game as they do in the cutscenes. More importantly, the PS4 version plays a lot better. The snappier response offered by the higher frame-rate makes the game smoother and more enjoyable to play, without sacrificing that certain chaotic physicality that defines The Last of Us' locomotion and combat. The higher frame-rate makes it easier to control, and the higher resolution makes it easier to aim and pick off enemies from a distance. Furthermore, I greatly prefer the PS4 controller to the PS3 controller, particularly for games that involve shooting. So: In general, the PS4 version feels much sharper than its predecessor, both in terms of control and visual fidelity. There is a little bit of jankiness, however. Now to the trickier part. There is a bit of funkiness going on at the outer margins of TLOU: Remastered. I almost hesitate to mention it, since I'm not entirely sure whether 1) The game is indeed a bit rougher around the edges than its PS3 counterpart or 2) It's so much sharper-looking and smoother that I'm simply noticing pre-existing rough edges and weird animations more. I'm of two minds on this stuff. For starters, it doesn't happen that often. The game generally looks great. And the PS4 version plays and looks so damned good so much of the time, and it controls better than its PS3 counterpart, that I barely register the few rough edges at all. All the same, I know that there are people who care a great deal about The Last of Us, people who would demand extreme polish from any version, particularly a much-ballyhooed (and expensive) current-gen version. I certainly wouldn't say that the PS3 version of the game was completely without bugs, but so far I feel as though I've been noticing a touch more oddness in the PS4 version than I did in the original. The Last of Us: Remastered is easily the best-looking version of the game, but it's not without a few visual hiccups. This is also a touchy subject, largely because it's tied to subjective tastes. The short version is that I found the higher frame-rate to be a great boon during gameplay, but a touch distracting during the game's pre-baked cutscenes. I've never quite bought into the whole "We want our game to look like a movie so we're only gonna make it run at 30fps" thing. But as it turns out, there really is something to it, particularly with a game that, like The Last of Us, aspires to be a seamless blend of passive cinema and interactive game. If you push that to 60 [frames per second], and you have it look the way we do, it actually would end up looking like something on the Discovery Channel, like an HDTV kind of segment or a sci-fi original movie maybe. Which doesn't quite have the kind of look and texture that we want from a movie. The escapism you get from a cinematic film image is just totally different than what you get from television framing, so that was something we took into consideration. It does feel a bit odd to watch the cutscenes in The Last of Us running at 60fps, like you're watching an HDTV with that motion-smoothing "soap opera effect" turned on. It's the same kind of discomfort that I and many other critics ran into when viewing the first Hobbit movie at a high frame-rate. The Hobbit Feels Like A Video Game. That&apos;s Not A Good Thing. "That movie sure felt like watching a video game." With The Last of Us: Remastered, it sometimes feels not like you're watching a film, but more like you're watching actors on a stage. It's not an altogether displeasing effect, but can be a somewhat distracting one. I should say that it was more noticeable on my computer monitor than on the HDTV in my living room, but either way, it was noticeable. FPS options are good, but a middle ground is missing. TLOU: Remastered comes with an option to turn on a 30fps lock, which lowers the game to 30fps and holds it there. That makes the in-game stuff less responsive but makes the cutscenes look "right," more like movies (which run at 24fps) than digital stage-acting. I asked Naughty Dog if they might consider patching in a third option that would allow players to make in-game stuff run at 60fps and pre-baked cutscenes run at 30. They were noncommittal, but said that as usual, they'd be watching reaction from fans once everyone starts playing. Also of note, since I've seen people debating this over the weekend: From what I saw running the day-one patched retail version of the game, the shadows, particularly the shadows cast by the sun, do look sharper when the game is running at 30fps. Some—not all—of the shadows in the game do appear sharper at 30fps. Now, here's the thing: I'm not one to say that "minor" resolution/graphical differences don't matter. I've argued that in some cases, they definitely do. But my verdict on the shadow thing: It doesn't matter to me even a little bit, nor does it affect my enjoyment of the game in the slightest. When the game is in action, I don't even notice it, and the gameplay benefits from running at 60fps easily outweigh any small visual enhancements gained by locking it to 30. The upshot: The Last of Us: Remastered looks lovely at both 60 and 30fps, and while it never quite matches the visuals in PS4-only games like Killzone: Shadow Fall and Infamous: Second Son, it's still a mighty handsome game, and more importantly, a very good one. The multiplayer will almost surely outdo the PS3 version in every way. For all the talk of The Last of Us' single-player story, it also shipped with a full suite of competitive multiplayer options. At the time the game came out, I didn't give the multiplayer enough credit. As time has passed, I've found myself repeatedly coming back to TLOU multiplayer, and find that I enjoy its stealthy, strategic brutality as much or more than almost every other competitive multiplayer game I play. I have to assume that, given the higher frame-rate and increased responsiveness, the PS4 version will offer the definitive take on The Last of Us multiplayer. It also stands to reason that as more and more players shift from PS3 to PS4, it'll remain easy to find well-populated PS4 multiplayer matches for a long time to come. Unfortunately, until the game is officially out and the servers start to fill up, I can really only make (educated) assumptions about all that. I'll play more this week and update this section with more concrete information as soon as I feel confident saying one way or the other. Photo Mode is a lot of fun. TLOU: Remastered's day-one patch adds a photo mode like the one Sucker Punch added to the PS4's Infamous: Second Son. Once you activate it, you can click the left thumbstick at any time in the game (not in cutscenes) and everything will freeze. You can then move the camera around, change your filter, depth of field, or angle, and snap screenshots to your heart's content. I've been having a lot of fun with it. Then again, as Infamous taught me, I think I kinda just love photo modes. If photo mode were a lady, I would marry it. If photo mode were a pizza topping, I would order it all the time, even when my friends wanted something else. I'm increasingly of the opinion that life should have a photo mode. The other extras are small potatoes. The rest of the new bonus features in TLOU: Remastered are less exciting. There are some new custom audio options that seem fine, I guess, but The Last of Us has always sounded really good and now it...still sounds good. The making-of documentary Grounded is included on the disc, but you can already watch the whole thing for free online. I was surprised that the TLOU: Remastered doesn't include a digital copy of The Last of Us: American Dreams, the terrific prequel comic by artist Faith Erin Hicks and writer Neil Druckmann. It's a notable omission, given how much American Dreams helps to understand Ellie as a character, and I could imagine a really cool Comixology-reader-type version of the comic that we could have read on our TVs. Oh, well. Most of the things listed in this article are not what made The Last of Us great in the first place. This article has been a granular (perhaps absurdly granular) look at the differences between two versions of a game. But it's important to keep one thing in mind: High-resolution shadows and character models did not make The Last of Us a great game. Frame-rate and resolution did not make The Last of Us a great game. The Last of Us was and will remain a great game because of its design and pacing, its writing, its music, and the performances of its cast. It was great because it surprised, delighted, horrified and thrilled us. It was great because it introduced us to Ellie, and Joel, and Tess and Riley and all the rest. It made us care about them, and it made us fight to help them survive. It was a great game because in the end, it moved us. Those things—the writing, the pacing, the characters, the heart—are unchanged from the PS3 version. What once was great still is great. So, should you get it on PS4? If you've never played The Last of Us: Yes, you should get the PS4 version. It's the best version of the game, and it comes with Left Behind, which still costs $15 online and in some ways manages to outdo the main game. If you've already played The Last of Us, thought it was good/fine, and never really came back to it: No, you probably don't need the PS4 version. It's still the same game. Save your money for something you haven't already played. If you love The Last of Us to death and have already played it more than once: Yeah, sure, get it on PS4. It's basically like getting the blu-ray collector's edition of a movie you already own on DVD. The new technology provides a good reason to play it again. If you dislike The Last of Us and/or think it's woefully overrated: You can safely skip this version. I doubt playing it again in 1080p will change your mind. I hope that's helpful. I'll have an updated review on the site soon and more multiplayer impressions later this week, along with some updated tips for newcomers.